Chinese Medicine and Applied Kinesiology in Penfield: Can Holistic Medicine Or Acupuncture Help a Frozen Shoulder? 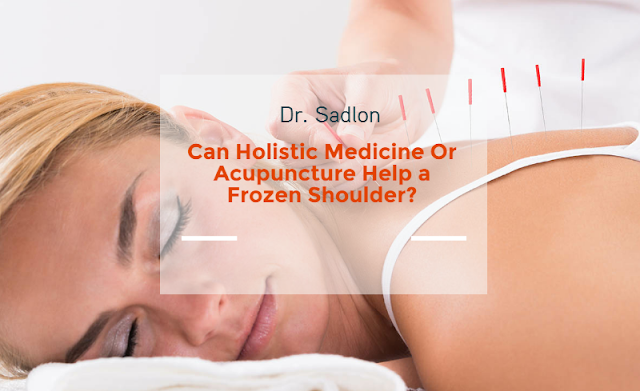 Can Holistic Medicine Or Acupuncture Help a Frozen Shoulder? Frozen shoulder is often a repetitive motion injury common in sports or the work place. It is also known as adhesive capsulitis. Often caused by repeated activity or a direct trauma to the shoulder. As a result, the connective tissue surrounding the bony structure of the joint becomes inflamed. This injury often limits mobility of both the arm and shoulder. This is especially true with rotation of the arm when trying to turn to palm of the hand up or down. Given time, the condition will usually healths on it’s on. However, if there is repeated trauma, fibrosis or scar tissue can build. This will up further limit the arm’s motion and if left untreated, the condition will take on a permanency. Treatment usually includes a course of anti-inflammatory prescriptions and a schedule of physical therapy. However, these procedures have their limitations as evident by the high rate of these patients who end up in surgery. A surgery can involve up to a 6 month recovery time and there is no guarantee the issue will be completely resolved after. Other therapies are often needed to bring the individual back to having a functioning shoulder. Fortunately, holistic medicine has something to offer. In acupuncture treatments, small needles are around the insert points of the muscles which make up the shoulder. The needles release trigger point under several layers of muscle and serve as input into the body’s nervous system. In acupuncture this is referred to as moving the body’s Qi. There are a number of different energy pathways or meridians which surround the shoulder. In acupuncture, the treatment is individualized to the patient. The selected protocol might involve several of these pathways along with distal acupuncture points in the lower body. The needling can also be combined with range of motion exercises and oriental medicine. This includes cupping, moxabustion, and Gua Sha. These adjuncts are all unique to Acupuncture and Oriental medicine. A simple chiropractic adjustment to the shoulder might also bring relief and range of motion back to the shoulder. So, how to avoid getting a frozen shoulder in the first place? 1) Pay attention to what your body is telling you. If your shoulder hurts after two days of raking leaves, be cautious about throwing a football to your kids. As with any other joint, the shoulder should be rested. Especially, if it’s not accustomed to a new repetitive activity. Once a trigger point is activated, the pain is often augmented by everyday movements. 2) Don’t sleep on a sore shoulder. Unlike the knee or hip a shoulder is not a weight bearing joint. The constant pressure of the body’s weight while sleeping can further aggravate the inflammation. If you must sleep on your side try adding an additional pillow. 3) Light stretching is also recommended. Any door jam in the hallway or window sill is an opportunity to safely stretch using the body’s own weight as leverage. With a little bit of added attention you’re be able to wave good-by with that frozen shoulder. Contact our offices for a consultation and learn how we can help you become healthy again.